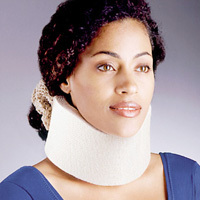 Unique collar design with an extended hook and loop closure adjusts to ensure a proper fit for neck sizes 13" to 19". Polyurethane foam is covered with a soft beige stockinette. Traditional low contour design maintains the head in a neutral position. Regular density. Universal Size 3 1/4"H x 15-21"L, Fits Neck Sizes 13-19"